So, my husband and I had the RV bug. Well, really we had the camping/outdoors/hit the road/see more scenery/get out of the house/get to hike again bug. 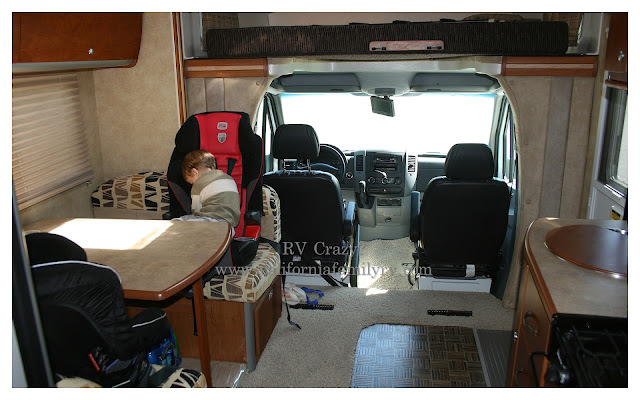 And with our three kids we really felt like the easiest and most enjoyable way to do that was to buy an RV. As I mentioned, my hubby had been researching them for quite some time now, and had really taken a liking to the Winnebago Views. 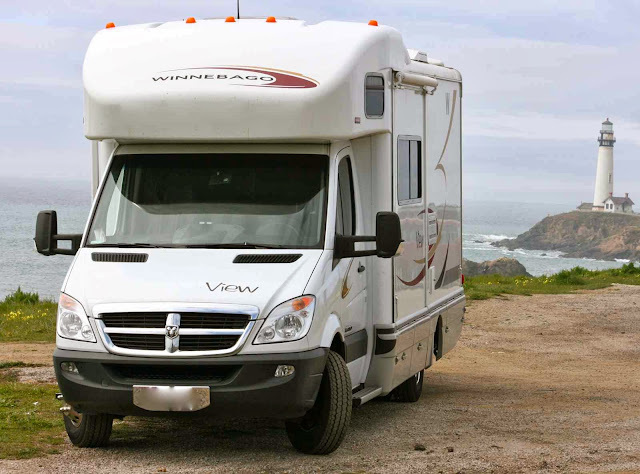 Of course selecting the right RV is so subjective, but after really evaluating everything, this model seemed to fit our needs best. Living in California, we were looking for something small enough that we could fit it in the more cramped camping spaces (especially at beach campgrounds). We were also looking for a diesel engine and for relatively good gas mileage. I also loved the View, because it was so easy for me to drive. I was very intimidated by the whole trailering aspect. I have driven a boat on a trailer, and let me tell you, it takes skill to manage a trailer. I am big enough to admit that it is not my forte. I could only imagine me trying to back the trailer in, calm my kids, and not have a nervous breakdown. Nope. That did not sound like fun to me at all! Having said that, I have utmost respect for those of you driving those big trailers and huge RV's. I have seen some serious skills in the campgrounds...there are a lot of good drivers out there. My hubs would have no issues driving anything at all (he's a fantastic driver), but I know my weaknesses. I knew if we got something too big, I would be hesitant to take it out with the kids by myself....or even help out during the long drives. So we went to look at the Winnebago Views again...and we were really impressed. Well, except for the price tag. So we went on a huge online search for a used model. We found several units, but only one was in our state. The photos looked good, the price was right, and it was only about an hour and a half away. Road trip! But when we arrived, the rv was in pretty rough shape. It was very dirty outside and in, and had rips in the upholstery, and was missing the table. Wow, photos can be kind of misleading. Anyway, it was all part of the process. The next View we found was in Texas. It looked perfect. My husband called and spoke to the owner of the RV Dealership. He did some initial dealings over the phone, and verified that it was the correct model we were looking for, it was in very good shape, the price was negotiable, etc. My hubs agreed to go see the unit. I would have loved to go too, but we have 3 small kids, and there was no way that was going to work out! So I sent "the hammer" to make the deal. We had settled on a price in our minds, and were (secretly) very excited about this vehicle. So, he flew out to the showroom, saw the unit, called me to tell me it was very, very nice. He negotiated a great deal, and was prepared to buy it. He called me and told me the deal was done, and it was ours. He then went out to the RV and (thankfully) checked the gas, and looked at the gas tank. Wait. Looked again. What? It was not a diesel. It WAS NOT A DIESEL! Sorry to yell, but this was one of our main criteria for getting this Winnebago View. He had checked with the owner over the phone (prior to flying to TEXAS) and asked him point blank if it was the diesel unit. &%*&#@!! Unfortunately, in that one particular year, Winnebago had manufactured a gas vehicle, and we were just lucky enough to have stumbled upon one of these models. Thankfully, we were able to get out of the purchase (we had proof in writing of their description of the vehicle as a diesel unit). My husband called me on his way back to the airport and told me what had happened. I was so disappointed. I thought he was kidding at first. It was a sad evening at our house. It took us quite a few weeks to begin looking again. But finally, my husband found another View for sale. This one was about an hour away in Orange County, California. Again, "the hammer" went to check things out so we wouldn't have to drag our feisty kids along. When he got back home, his narrative was pretty entertaining. Apparently, the owner was selling the rv, but was joined by two "thug-looking" heavies while they tried to basically strong-arm this guy into selling the vehicle. They were in a dark parking lot, and it was strange and uncomfortable. I was glad I wasn't there! It was way overpriced and not in great condition, and we weren't really keen on buying from the mafia (kidding! I think) so we passed. A few days later, we spotted a very clean, nice-looking View for sale at a great price. Wow! Seemed too good to be true. What could be the catch? The catch? It was in Fargo, North Dakota. hee hee. Have I mentioned we are in California? And that it was February? Oh well, my dear husband is nothing if not persistent, determined and willing to work very hard to get a great deal. He called and spoke to the owner (RV Dealership) and explained the situation. The guy was a class-act. He explained that he actually sold units from afar on a regular basis. The owner even shot some video and some extra photos to send to us. He even took a few shots of the only (cosmetic) issues with the rv, and explained that he wanted us to know everything before we arrived, because he wanted us to be happy with the vehicle. I really, really, wanted to go on this excursion with my hubby. It was so exciting, and if we purchased the View it would be so much fun to drive it home together. Our first rv trip cross-country in the new "rig." Sadly, it was not meant to be. We couldn't get either of our parents to come for a "visit" to watch our kids (both sets are out of state) so my man decided to go alone. I was really worried about him taking the trip alone. Not that I didn't trust him, or his abilities, but you never know what could happen. Especially with a new vehicle that we didn't know everything about. Thankfully, his awesome friend thought it would be a fun adventure too, and happily agreed to take the trip with him. I was very happy & relieved. So, they went to visit Fargo in February, and drove home to California with our brand new (to us) Winnebago View! P.S.- My husband will probably cringe when he reads this story where I make it sound like a drive from Fargo, ND to California is just a simple little thing. In reality it involved packing everything from emergency hand-warmers, a compact snow shovel, emergency rations, sleeping bags, weather radios, navigation systems, and everything else a concerned wife and cautious husband would pack for a journey of that magnitude. All of these necessities were carefully packed in a bag that did not exceed 50 lbs (per airline regulations) and promptly LOST by the airlines. Yes, you read that right. They lost his bag. And, to add insult to injury, my husband, driving a new (to him) rv across the country, beat his own bag home. Yes, that's right. The bag arrived two days after my husband did. Marvelous. Anyway, we were in such fantastic spirits, we didn't mind...much. Okay, i'm still bitter, but it's fading. It's so funny that you left a comment on my blog today. I just wrote a post last night welcoming you as a frequent reader with a link to your blog. It will be up later today as I have to get to a hotspot to upload my posts. Using our aircard and being at the end of the billing cycle doesn't give me much leeway when I've got posts filled with pics. I'm enjoying your new blog! Thanks so much Snookie. I really appreciate it! Thanks Jen. I promise to post inside pics soon!